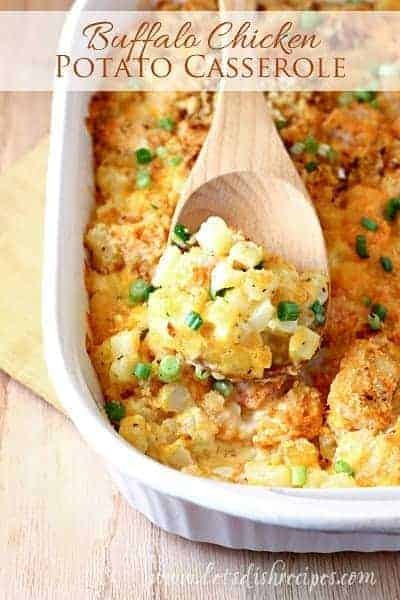 AWARD WINNING BUFFALO CHICKEN POTATO CASSEROLE — Cheesy diced potatoes combine with hot and spicy chicken in this heartwarming casserole. Where I come from they call it “funeral potatoes.” Don’t ask. I found this recipe a few months ago and we have made it about once a week since. Sometimes twice a week! We absolutely love it! Anyway, this Buffalo Chicken Potato Casserole is basically a kicked up version of that casserole. And yes, it’s full of all kinds of processed food and fattening ingredients. Don’t judge. Or go right ahead and judge if you’d like. That won’t stop me and the rest of my family from eating this delicious, slightly spicy, satisfying meal! This is serious comfort food–cheesy, creamy, and crunchy, with a little bit of kick. This hearty, satisfying casserole is part of our regular dinner rotation and there are never any leftovers! I even won a funeral potatoes recipe contest with this recipe. True story! 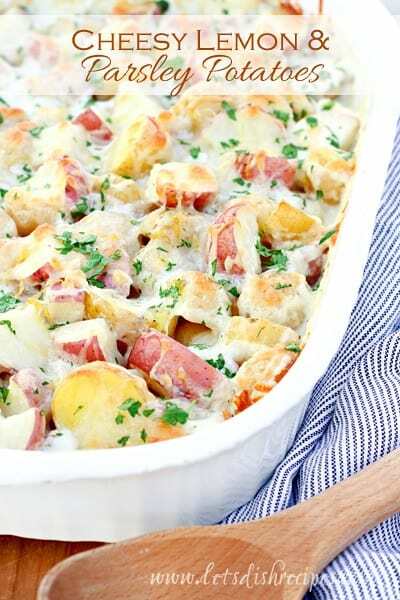 And did I mention, this casserole is super easy to make? Simple and delicious. What more could you ask for in your comfort food? 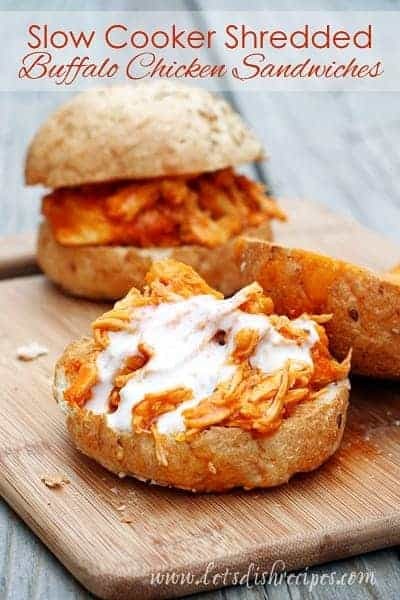 This cheesy Buffalo chicken is a real winner–literally! Be sure to save this Buffalo Chicken Potato Casserole recipe to your favorite Pinterest board for later. Preheat oven to 350 degrees. Spray 13 x 9-inch baking dish with non-stick cooking spray. In medium bowl, stir together cubed chicken and hot sauce. 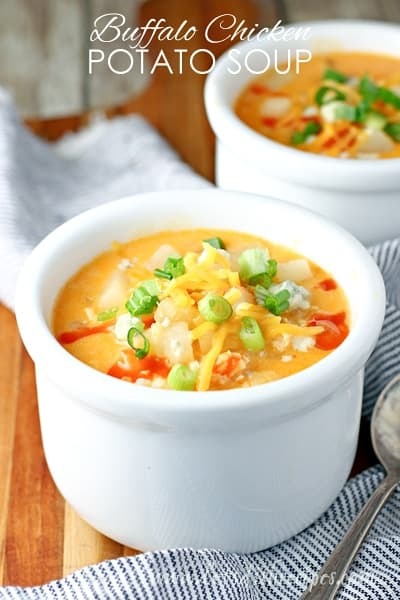 In large bowl, stir together potatoes, ranch dressing, cheese and soup. Season with salt and pepper, to taste. Spoon into the prepared baking dish. Distribute chicken evenly over potato mixture. In small bowl, stir together the cracker crumbs and melted butter. Sprinkle evenly over chicken. Cover with foil and bake for 25-30 minutes; uncover and bake 20-25 minutes longer or until potatoes are tender and chicken is cooked through. Sprinkle with green onions just before serving. Who Dished It Up First:Adapted from Cassie Craves. I’ve made something like this and loved, loved, loved it! This looks great, thanks! Funeral potatoes. I love it. The area of Texas I’m from is all about barbequed brisket at everything- funerals, weddings, parties, and more. The meat version of funeral potatoes, if you will. 🙂 This recipe sounds like the perfect meal for a day like today! Our weather is stormy and cool, and great for warm comforting meals from the oven. okay, maybe this question is retarded. I’m just a new wife and an inexperienced cook. With the cubed chicken…. is it cooked or raw? If there is a way to mess up a dish. i’m the type that will find it. It’s raw–it cooks in the oven while the casserole is baking. Looks and sounds so yummy!! I have just had surgery but my husband saw this recipe and declared he was going to make it for dinner this for us!! Can’t wait, ill let you know how we make out!! Thanks for sharing! you are so amazing! Every recipe I see on your site makes me so hungry! I found this recipe a few months ago and we have made it about once a week since. Sometimes twice a week! We absolutely love it! I even switched it up one week and made it with honey bbq instead and it was so good! This is definitely one I’m going to pass on! I made this dish this week. It was delicious!! I seasoned the chicken with Complete Seasoning, garlic and onion powder. That’s the only modification I did. I’ll definitely make this again. HI! 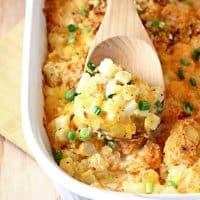 Did you cut the chicken into bite size pieces before adding to the dish to cook with potatoes? Also, can i cut russet potatoes into bit size pieces instead of using frozed southern potatoes? Yes, in the ingredient list it states the chicken should be cubed. I have never made this with diced russet potatoes. I assume it would work, but the cooking time might be different, because the hashbrowns are somewhat pre-cooked.